Lunar New Year day falls on 8 Feb. This day denotes the start of the new lunar year, which is the Year of the Monkey. The monkey is the ninth animal in the Chinese zodiac (see my previous post) People born under this sign are supposed to be smart, quick-witted and lively, like the monkey. Of these, the exceptions were the ones designed by Nguyen and Yoshizawa. Nguyen’s model became my favourite, though there is a fair amount of shaping required and I am usually not keen on moulded designs. However, as you can see they are not complex designs, so I decided to use all the animals together in the picture. With the current interest in Star Wars again after a decade-long hiatus, and at the prompting of a friend, I decided to re-visit the Yoda model that I folded almost 20 years ago. Yoda, the sprightly Jedi Master, is one of my favourite Star Wars characters. 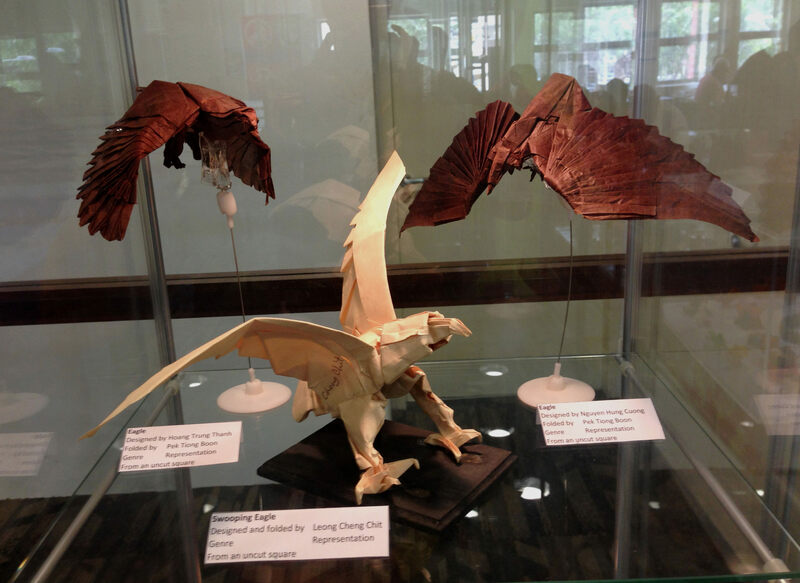 The model I folded is designed by Fumiaki Kawahata. I thought it was well-designed and very expressive. Here is the newly-folded Yoda. 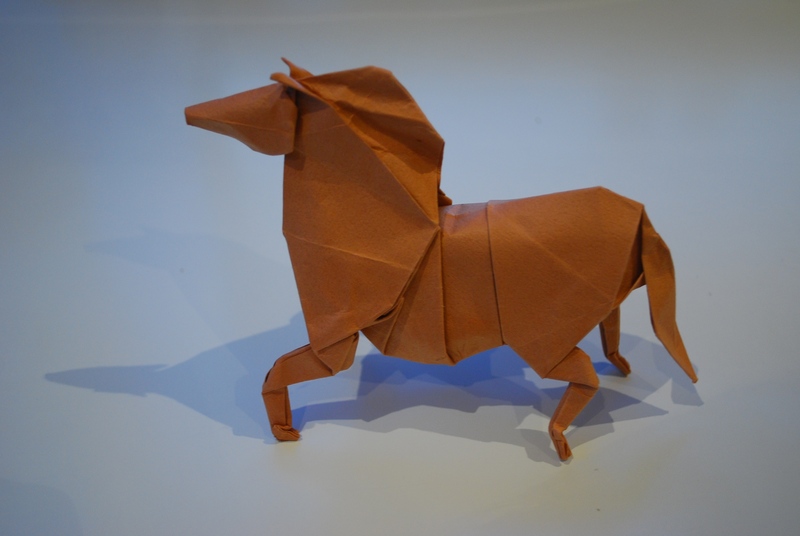 For those who are interested, there is an excellent Youtube video by Jo Nakashima showing how to fold Fumiaki’s model. He also pointed out that Yoda has only 3 fingers (as folded here) instead of the 4 fingers as designed by Fumiaki. 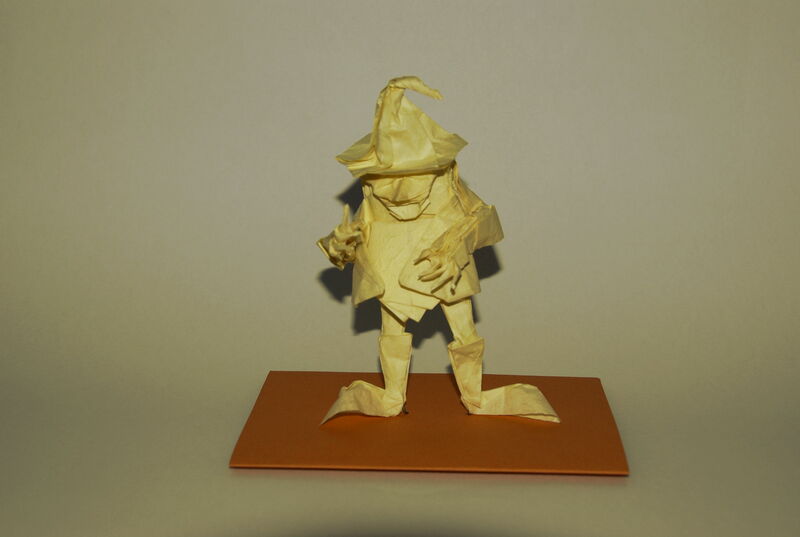 For the origami folders, I have also colour-changed Yoda’s stick from the original green to brown. 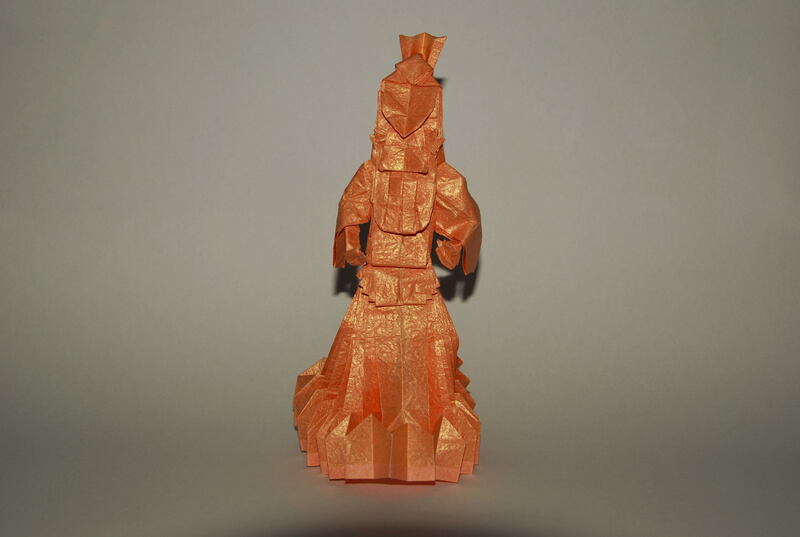 After folding Yoda, I surfed the net for other Star Wars characters to fold. I found Darth Vader, a Sith Lord of the evil Empire. This model is designed by Ignacio Smith. I particularly like the sweep of his cloak and the majestic portrayal of Darth Vader. The model of Yoda stands at 9 cm, and Darth Vader at 20 cm. Darth Vader. Youtube and video by Ignacio Smith. 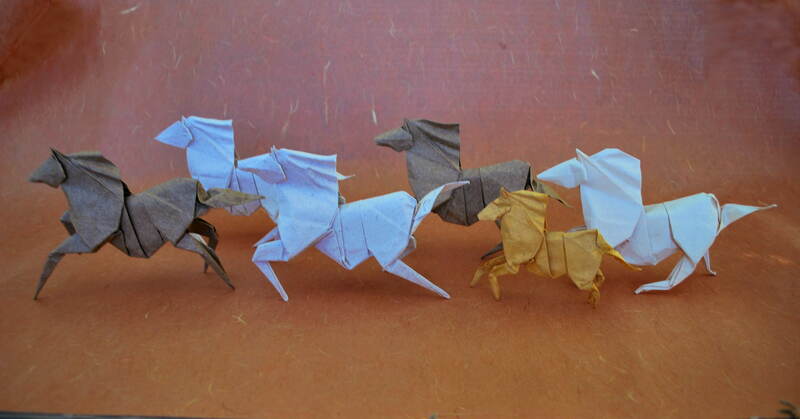 I am a great admirer of Akira Yoshizawa, and this is my rendition of his zodiac animals folded a few years ago. They are all designed from the same (bird) base. Since 2010, I have also been folding my favourite origami model of the animal that represents the new zodiac sign, to make a lunar new year greeting e-card from it. 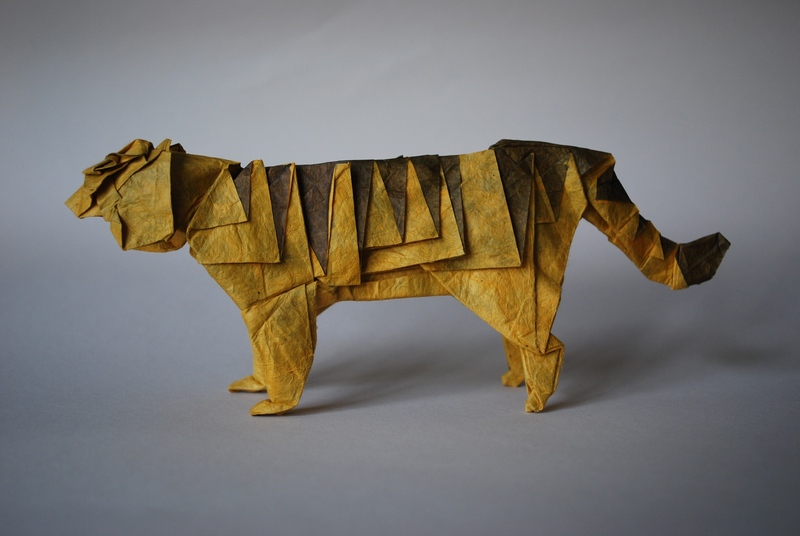 2010 was the Year of the Tiger, and I folded Hideo Komatsu’s model. It was a very realistic version complete with stripes (which actually inspired me to start the series). Since then, I have kept to my goal of folding a model and making an e-card for each lunar new year. Here are the results so far. I do hope to continue this in the coming years, so stay tuned. Robert Lang’s model hs a special place in my heart as it was one of the earliest “good” models that I folded using wetfolding. In 2011, someone asked me to design a standing model as it was the rage then, and so I obliged with a variation of Lang’s model which you can also see in the picture. This dragon head is another of my favourites. The dragon in Eastern mythology is an auspicious animal. This one has many details of the head and comes complete with scales, which at the time the model was designed was rare. This snake, a cobra, is designed by my friend Ronald Koh (I tweaked the look). 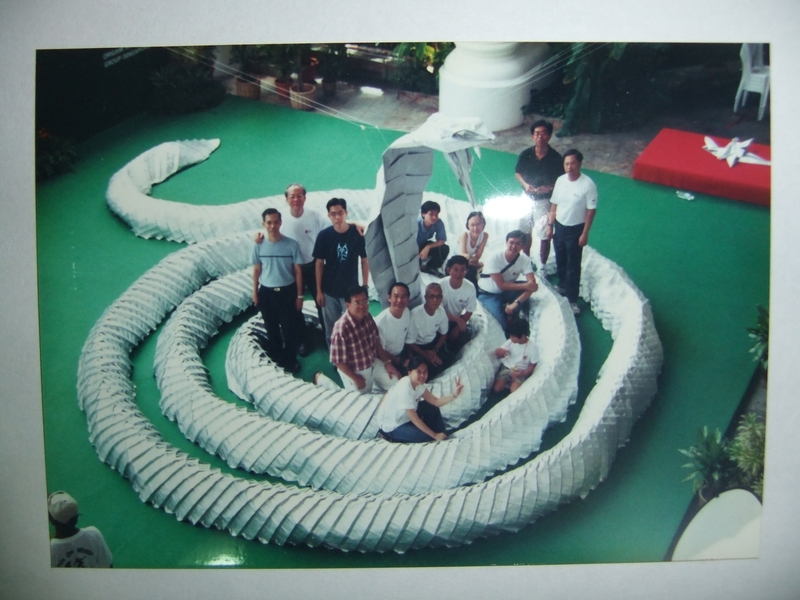 Ron’s cobra made history when the Origami Singapore group folded the world’s longest origami snake in 2001, which stood at 45 m long . So, this will be a work in progress and I will add a new model every year. The lunar new year falls on 19 Feb this year, ushering in the Year of the Goat. The goat is the eighth of 12 animals making up the Chinese zodiac. People born in the Year of the Goat are supposed to be gentle, amicable and have a strong sense of justice. The Chinese character for goat (羊) is a generic one, and can stand for either a mountain goat or sheep. Conventional wisdom is that there were no sheep in China in the past, so the goat is usually chosen. It is also a more spritely animal. I have been folding an origami animal to make an e-card every year since 2010. This year, I folded 2 designs. 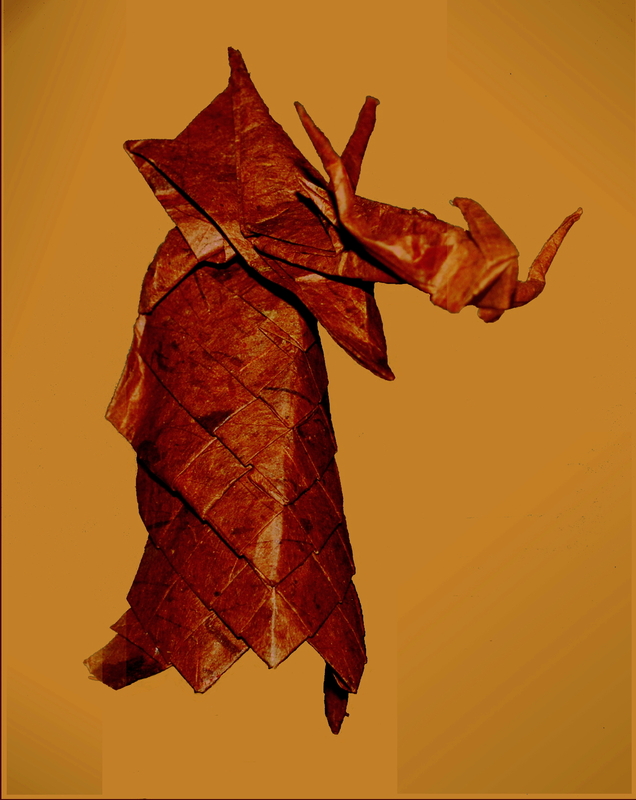 The first is a 2-piece design by Akira Yoshizawa folded from a bird base, which I chose to use for me e-card. You can see it here. 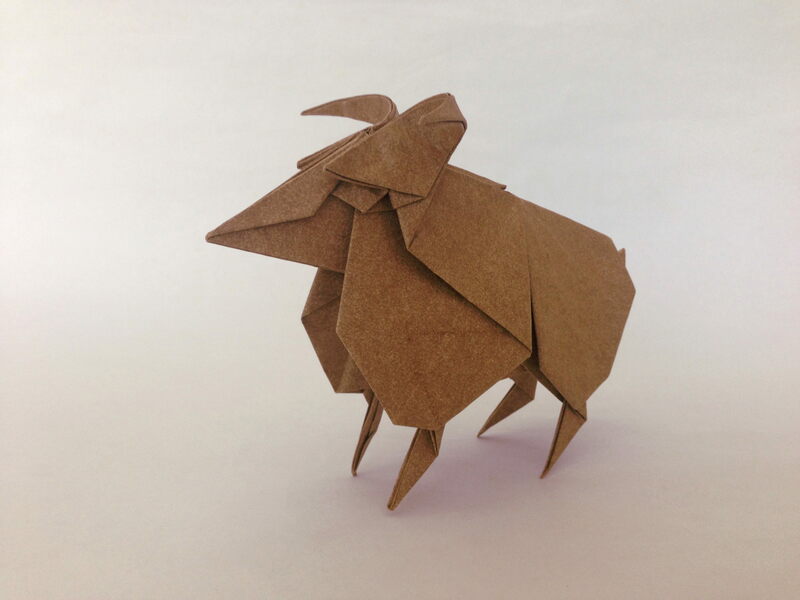 The other design which I liked was the goat designed by Jun Maekawa. It is a stout and majestic animal. Here’s the completed model. I posted an article on a one-piece Origami box with lid 2 years ago. The walls of the box at the top folds up nicely to form the cover. That was a neat idea. I recently folded 2 figures – a Lady and a Tramp. Both are box-pleated models. The Lady strikes an elegant pose, while the tramp looks lively and quirky. The Tramp is a dwarf designed by Eric Joisel. 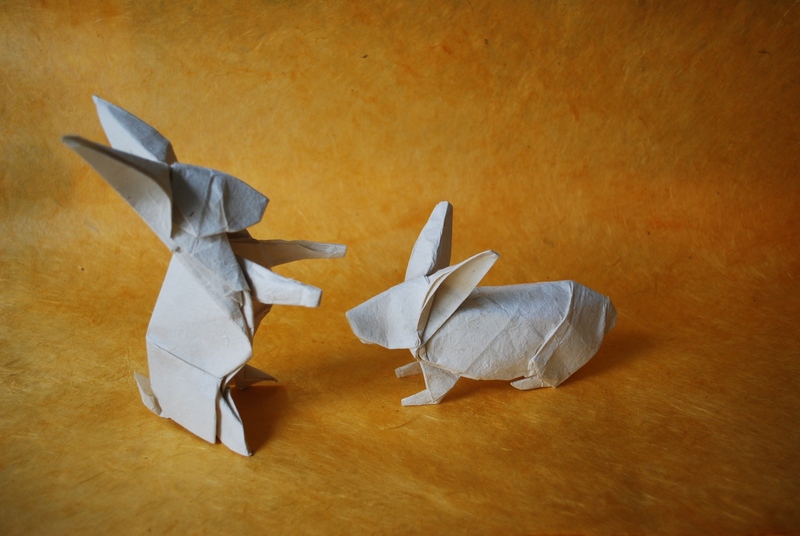 The CP is available in Eric Joisel : The Magician of Origami. It is a 28 x 28 box pleated model. I look forward to folding the musicians designed in a similar vein as the dwarf, though it will be quite a challenge (to me at least). I am partial to horses, since I am born under that Chinese zodiac sign. 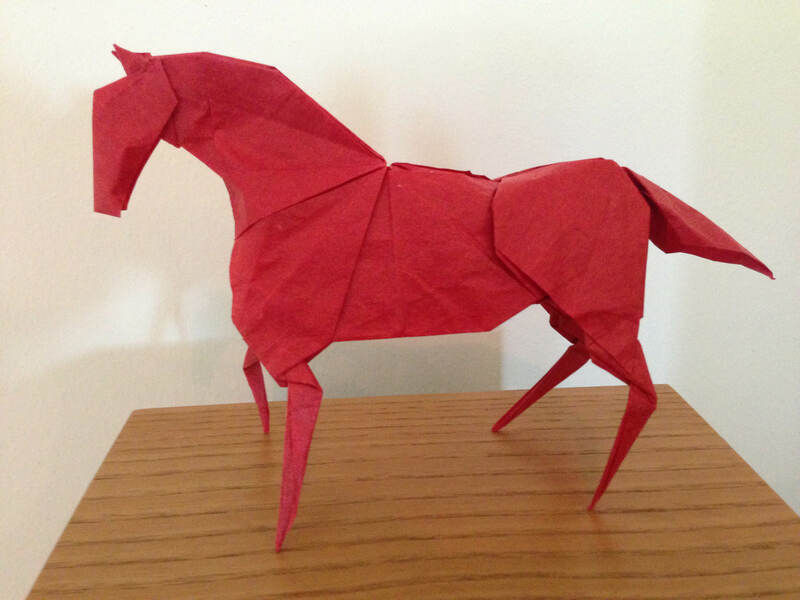 To prepare for the Year of the Horse, I reprised the origami horses I folded before. One of the earlier ones was Anibal Voyer’s horse, since diagrams were then hard to come by and this one was available on the internet. And it was good. Since then, another model I came to like was Issei Yoshino’s horse with its majestic pose, reminding me of a Tang dynasty ceramic horse. For the upcoming new year, I have been re-folding some of the models I liked. One of them is the design by Hideo Komatsu, which I portrayed in fiery Chinese New Year red. In the days leading up to the Chinese New Year, I worked with a local production house which was producing a stop-motion video for a client to mark the festive season. Here’s a link to the video, courtesy of the production house. 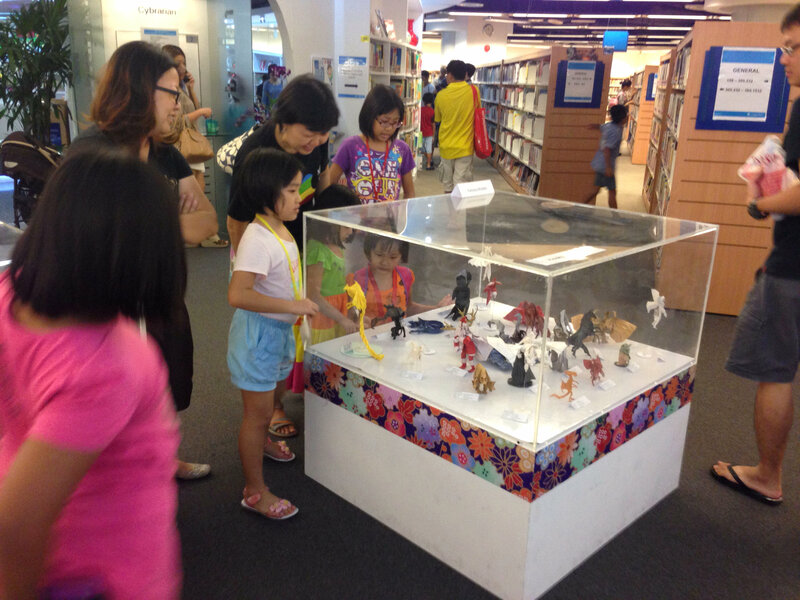 The Origami Singapore group organised a curated exhibition which concluded last month. Titled “Origami : From Traditional to Modern”, the exhibition traced the development of origami from a traditional craft to the cutting edge designs of today. There were more than 200 models on display. The exhibition was held for about 3 months, from 8 Sep to 29 Nov. 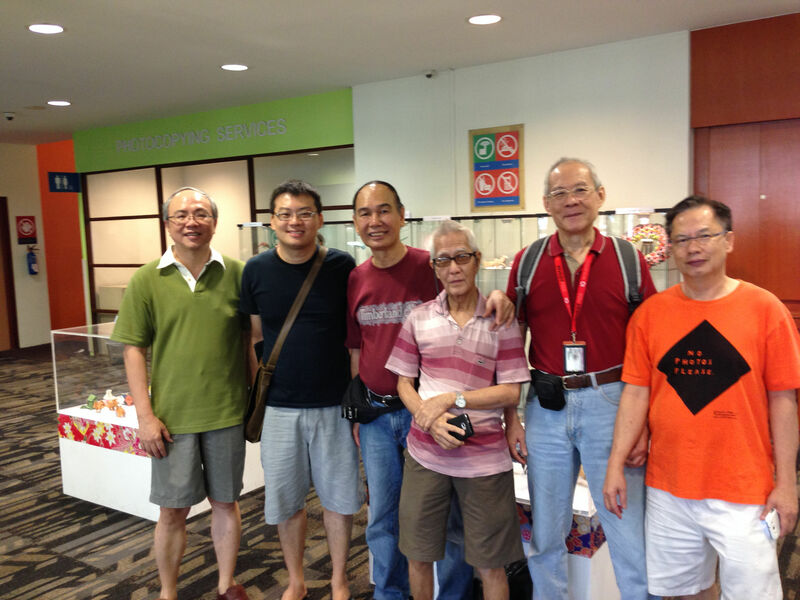 The exhibits travelled to 3 different locations of the National Library, and the exhibition was kindly supported by the National Library Board. 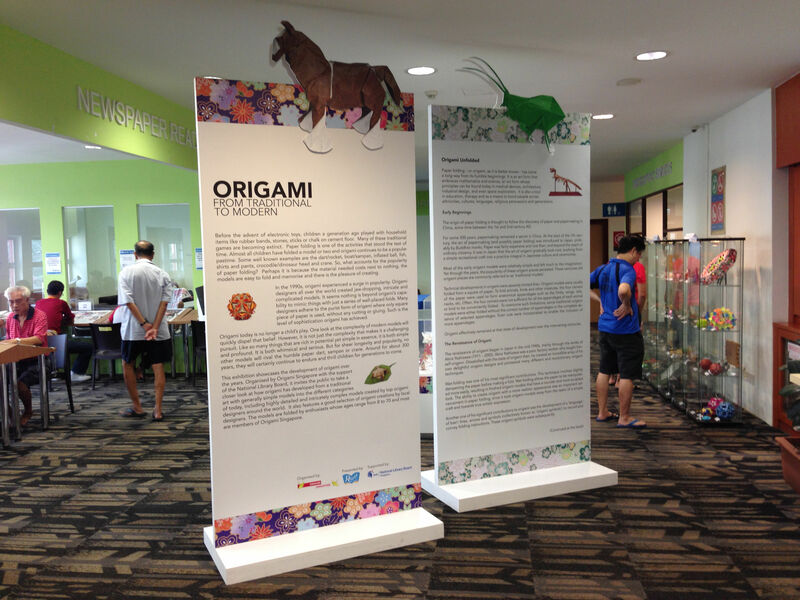 The aim of the exhibition was to showcase origami in Singapore to the public, and encourage interest in origami in Singapore. 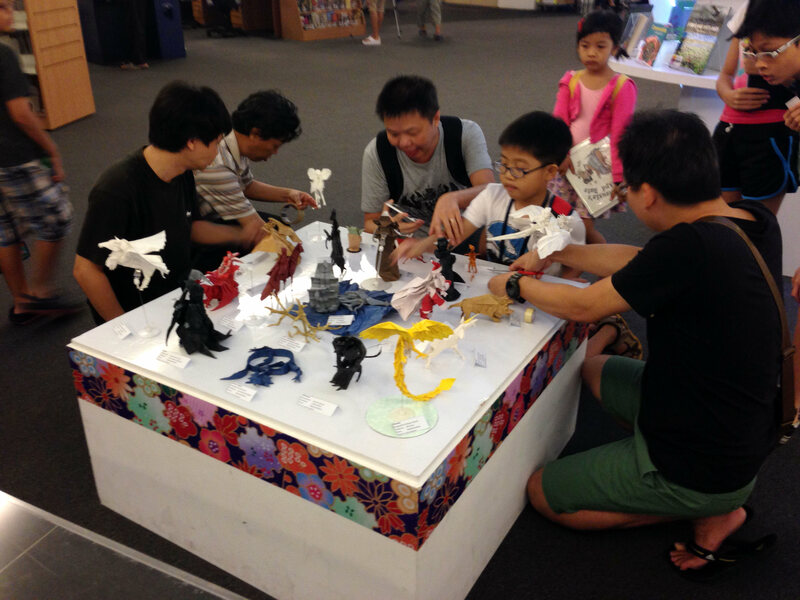 The “traditional” section featured models that were traditionally folded in Singapore. More than 30 models were on display, including the sampan, dragon head, yacht, jumping frog, shirt/trousers, mandarin hat and shuriken, to name a few. It was well received by the public and brought back fond memories to the older generation, many of whom were familiar with the models. The section on “intermediate” models featured mostly models designed in the 60s to 80s, and included geometric and modular pieces. 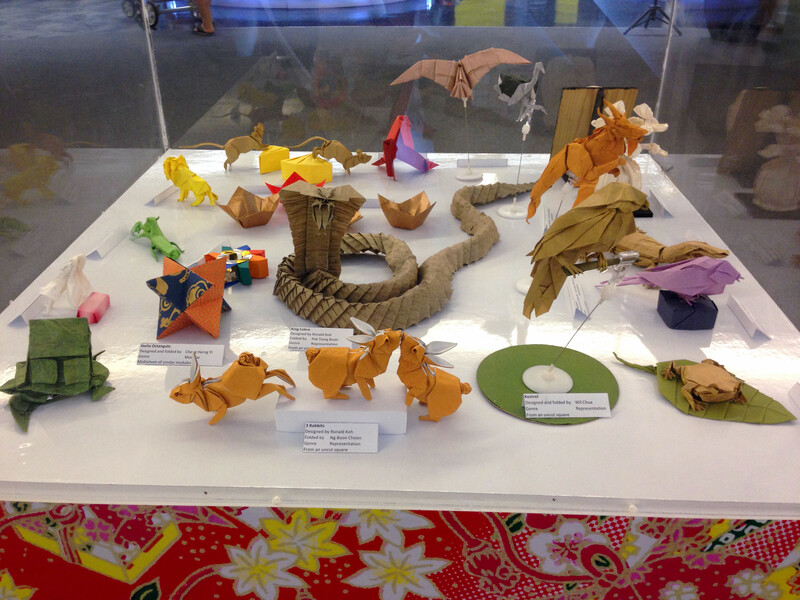 The “complex origami” section was the best represented. It showcased designers from all over the world, and many of the models featured were their latest designs, which thanks to the internet were already well known among Singaporean folders. Special mention must be made of the showcase of designs by Singaporean folders, which were of a high quality. 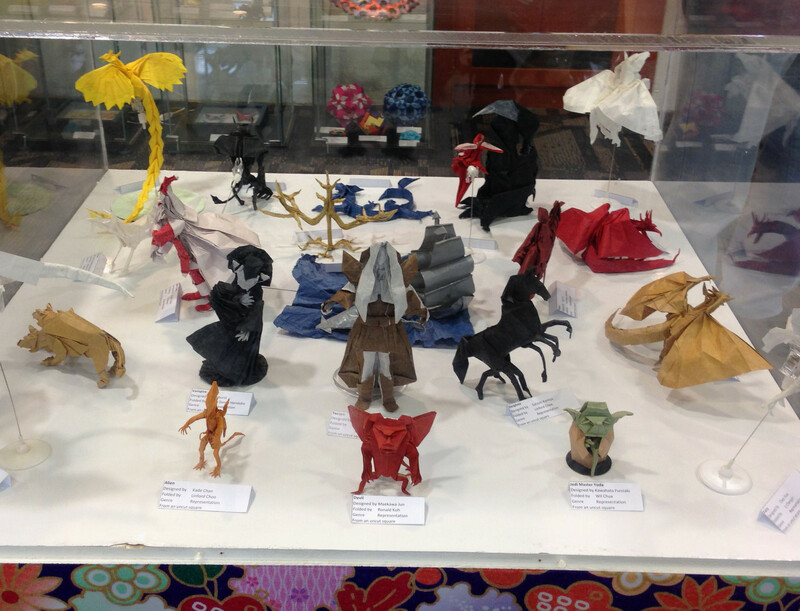 The exhibition also featured models folded by young folders under 20, including two who are below 10 years. 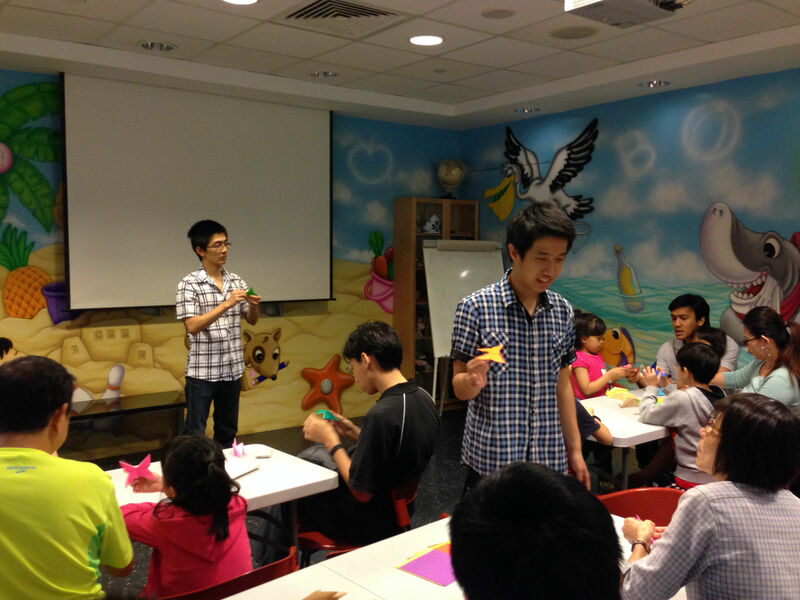 Workshops for the public were conducted at all 3 locations. Here are some more photographs from the exhibition. Hope to upload more photographs when I have sorted them out. It has been my practice to fold the Chinese zodiac animal for the lunar new year. 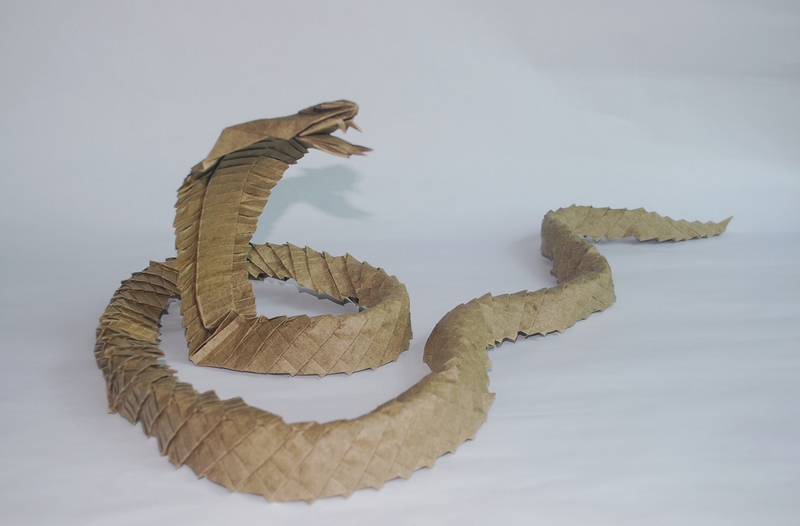 This year, the lunar new year starts on 10 Feb, and it will be the Year of the Snake. What do a rose, a sundial and a pine cone have in common? 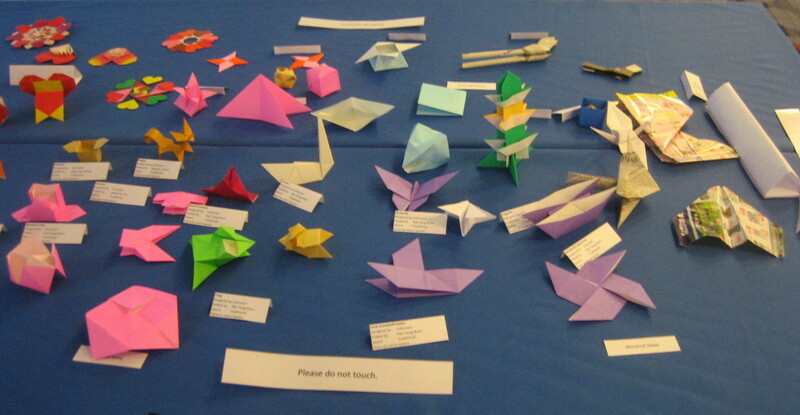 In origami, you can form all of them from the same basic design. Specifically, they are folded from the same fractal design. A fractal is an object that is made from a self-similar pattern, that is, as you zoom into one part of the object you can see the same pattern repeated there in greater detail. There is a pine cone I folded from a design by Kunihiko Kasahara that can be found in his book “Origami for the Connoisseur” published in 1987. I have had this pine cone for more than 20 years and it still looks good as you can see from this photo that was taken today. I thought the design was “cool”. And as is obvious, the face of the pine cone is an Andrea’s rose. Have fun with fractals and tessellations – there are lots of diagrams available on the internet.